Located in historic, downtown Wilmington, surrounded by beautifully restored 19th-century homes and tree-lined neighborhoods, the meticulously renovated Wilmingtonian extends an invitation to unwind, relax, and absorb the romantic ambiance of Cape Fear Country. Just minutes from the New Hanover International Airport and spectacular Atlantic Ocean beaches, The Wilmingtonian, a small seductive hotel, offers luxury suites and provides the privacy of an intimate inn but with a diversity of services and accommodations. Wilmingtonian B&B The five buildings of The Wilmingtonian complex house a total of 40 unique suites, plus dining rooms and lounge facilities, conference and meeting rooms. With buildings dating from 1841 to 1994, the crown jewel is the elegant de Rosset house, a beautifully restored 1841 mansion and landmark pre-civil war home. The Dram Tree house (circa 1904) and the other three buildings in the complex have all been restored or built to provide the utmost in comfort to the discriminating traveler. Surrounded by extensive gardens and ponds with courtyards and balconies, The Wilmingtonian offers a haven of tranquility amidst the bustle of the old port city. The Wilmingtonian is in the "heart of it all", uniquely situated for guests to enjoy downtown's renaissance. Whether coming to Historic Wilmington for either business or pleasure you will enjoy the many attractions and activities that are only steps away. The central business district, museums, galleries, antique shops, boutiques, fine restaurants, coffee shops and local nightspots are within easy walking distance. 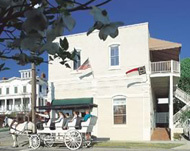 Enjoy a play at historic Thalian Hall, step back in time with a horse and carriage ride, or tour historic homes. The Cape Fear River is only two blocks away where you can cruise the river aboard a paddlewheel steamer or simply stroll along the Riverwalk.